← The Open Laboratory 2013 is out! Another new Valancourt Books edition of a classic John Blackburn book has been released, and it includes another masterful* introduction by me! This time, the book is John Blackburn’s 1977 novel The Cyclops Goblet. John Blackburn (1923-1993) was a prolific author of books containing a unique blend of thriller, science fiction and horror, producing some 25 novels over the course of his career (I talk about a number of them on this blog). His work was also extremely popular in his time, but was sadly almost completely forgotten after his death — until Valancourt started reprinting his books over the past year. The Cyclops Goblet marks an interesting departure from Blackburn’s usual fare. It can be considered a classic “caper” story, in which a series of crooks attempt to pull off a spectacular heist — and try to double-cross each other in the process! The Cyclops Goblet features as protagonist the scoundrel Bill Easter: a former gangster, bodyguard, and current and perpetual con-man. As the novel begins, he is flat-broke in London with his common-law wife Peggy Tey, and the two of them are struggling to pay the rent when they are contacted by Colonel Wellington Booth, the head of a fascistic British Nationalist movement. Booth tasks them to help steal a priceless Renaissance art collection, the Danemere Treasure, which is currently locked in a perfectly impregnable vault. Or is it impregnable? And is it locked in the vault? As Bill and Peggy join the plot, they learn that the treasure is reportedly cursed, and supposed to bring death and misery upon any who owns it. What follows are twists and turns, crosses and double-crosses, as multiple parties work together and against each other in order to seize the treasure for themselves. In the end, they will all find that the curse is not mere legend, and a truly deadly secret is tied to the fate of the artifacts. In my introduction, I give a bit of background on John Blackburn and his works, and summarize the earlier stories of Bill Easter to get readers up to speed on his adventures, which do play a significant role in this novel. I also note several possible inspirations for the story and settings of The Cyclops Goblet: Blackburn often featured current events and unusual locations in his books, in addition to his own life experiences. 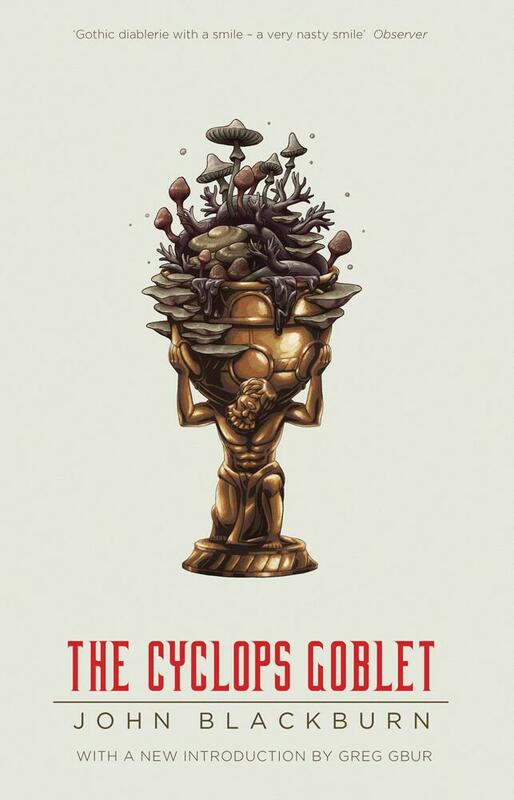 In short, I can recommend The Cyclops Goblet as a very enjoyable horror-thriller-comedy! Its unusual characters and bizarre story make it worthwhile to explore. I expect to write at least one more introduction to a Blackburn novel in the near future, possibly for one of his best works! Keep an eye on this blog for details.